The district-level rally of the BJP against price rise today turned ugly when state president of the NSUI, Yadhupati Thakur, and his supporters were thrashed and the former had to be hospitalised. Even as the government is keen that the proposed Town and Country Planning (TCP) Act, which will replace the earlier three-decade Act, is introduced in the Assembly, failure of the Cabinet sub-committee, specially constituted to examine the proposals, in holding a meeting, could further delay the entire process. Protest demonstrations were held all over the state by the CPM to condemn the firing incident that took place in Chamba district on Sunday. Chabads, the Jewish congregation centres at Manali, Kasol and Dharamkot-Bhagsunag belt in the Dhauladhars, and the exclusive foreigners’ meditation centre here in the town can be “possible targets” of terror attack.Though the police denies any terror links, “terror perception” of the Home Ministry has raised questions in the minds of residents as the aftermath of the 26/11 Mumbai terror attack, Pune bomb blast and the “cow slaughter” incident at Nerwa Chopal in Shimla, have any linkages or not. With the Ministry of Commerce according its principle approval to Rs 60 crore Common Effluent Treatment Plant (CETP) for the industrial hub of Baddi-Barotiwala-Nalagarh (BBN) at a meeting in Delhi today, the pollution woes of the area would be eased. The Beopar Mandals of Palampur, Kangra, Nagrota Bagwan, Jwalamukhi, Pragpur and Dehara Gopipur, in separate resolutions, yesterday demanded restoration of the office of Commissioner of Income Tax (Appeals) at Palampur which was closed by the Income-Tax department. The state agriculture department today honoured 24 progressive farmers from six development blocks of the district at a function organised here today, which was presided over by education minister ID Dhiman. The state fruit and vegetable growers’ association has supported the government’s move to auction the apple carton factory and asserted that the financial health of the sick public sector unit had deteriorated beyond redemption. It also hailed the decision to set up an engineering college at the site in the public sector. GoC-in-C of the local Army Training Command (ARTRAC) Lt Gen AS Lamba has advised everyone to take important lessons from the fatal avalanche at the High Altitude Warfare School (HAWA) in Gulmarg which claimed the lives of 17 Army personnels. Chief Minister PK Dhumal has underlined the need to give boost to organic fertilisers to gradually phase out chemical fertilisers.Addressing scholars of the Tropical Agricultural Research and Higher Education Centre at Turriba in Costa Rica, yesterday, he said diversified farming with organic inputs was proving beneficial for the farming community as there was a good market for such environmentally safe farm produce. Three persons were killed and 34 injured when a bus of the state road transport corporation fell about 200-ft-down into a khud near Jabli in Solan district in the wee hours of the day.While two persons died on the spot, one woman succumbed to her injuries at Government Medical College, Chandigarh. The ill-fated bus was on its way from Delhi to Bagha (near Daralaghat). Twelve injured persons were referred to Chandigarh, three to civil hospital, Solan, an the rest were hospitalised at Parwanoo. The BJP today held a protest against unprecedented price hike, blaming the Congress-led UPA regime in failing to take effective steps in this direction.Senior BJP leaders and workers held a protest rally outside the Deputy Commissioner’s office. The leaders also submitted a memorandum addressed to the President of India to the DC demanding concrete steps to check prices or else dismiss the UPA regime. Himachal Pradesh will soon set up a centre for climate change, disaster management and snow and glacier studies to help chalk out mitigation and adaptation strategies and enhance preparedness for natural disasters. The police here stopped and checked a red beacon-bearing Fiat Fiana car (HR05-X0404) of a senior Haryana police officer and challaned it and fined Rs 300 under Section 177 of the Motor Vehicles Act from the car driver. One person was killed on the spot when the vehicle which he was driving went out of control and fell into a 70-metre deep gorge at Keru Pahad on the Dalhousie-Pathankot highway, about 32 km from here, last night, the police sources said here today. A daylong National Service Scheme (NSS) camp was organised at Government Senior Secondary School, Mahadev, near Sundernagar yesterday. The district-level rally of the BJP against price rise today turned ugly when state president of the NSUI, Yadhupati Thakur, and his supporters were thrashed and the former had to be hospitalised.The BJP workers were organising a pre-planned rally at the Kachehri crossing against price rise according to the national programme. About 20 NSUI activists also came to the spot, raising slogans against the state government. They were also going to the district administration to submit a memorandum, condemning the government for price rise in the state. The cross slogans led to heated exchanges between leaders of the BJP and NSUI activists. Later, BJP workers, who were present in a considerable strength at the rally venue, caught hold of NSUI activists and thrashed them. Senior leaders of the BJP, including local minister Kishan Kapoor, alleged that the police had failed to make adequate arrangements to prevent the clash. 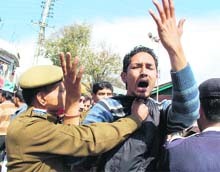 However, Dharamsala SDM said the NSUI had not taken any permission from them for organising the rally. What perplexed everybody was the presence of Yadhupati Thakur, who belonged to the Jogindarnagar area of Mandi, at Dharamsala today. Even the authorities were busy gauging if the clash was pre-planned or not. Meanwhile, BJP leaders demanded police action against NSUI activists for disrupting their rally. Kangra SP Atul Fulzele, when contacted, said legal action would be taken in the matter after investigation. The clash has, however, kindled the political milieu in the area. State president of the Youth Congress Manmohan Katoch, while talking to The Tribune, flayed the incident. The Youth Congress would launch a state-level agitation against such act, he said. Meanwhile, BJP leaders, while speaking at today’s protest rally, alleged that price rise was the result of profiting by a certain minister of the state in the UPA government. The Prime Minister and other senior Congress leaders cannot be absolved from the responsibility of failing to check price rise in the country, they added. It was at the Cabinet meeting held on December 18 that the government decided to constitute a Cabinet sub-committee, comprising five ministers, to examine the proposals so that it could be introduced in the ensuing Budget session of the Assembly starting in the first week of March. However, the committee, headed by Public Works Minister Gulab Singh Thakur, has not held a meeting till date. Other members of the committee include Forest Minister, Rural Development Minister, Horticulture Minister and Transport Minister. Meanwhile, the request of the TCP department to the Centre regarding certain clarifications with regard to Section 16 pertaining to subdivision of land has been referred back to the state government. “The Centre has directed us to first bring about the enactment of the new Act and then take up the matter with it,” said sources. It is with the objective of bringing about regulated and planned development that it has been proposed to bring the entire state under the ambit of the new Act, including the rural areas. In order to keep the procedure simple for villagers, all construction activity in rural areas, being undertaken in accordance with the prescribed limits and for personal use, will not require any permission from TCP authorities. At present, the TCP Act is applicable in only 22 towns of the state and 29 urban areas are still out of its ambit. “Unless and until the new Act covers the entire state, the government will continue to lose out on revenue as big industrial units, medical colleges and hotels coming up outside the planning areas, are not contributing to the state exchequer,” the sources added. What is even worse is the fact that villagers are being made to suffer as big units put a strain on local resources and get away by paying nominal amount. Moreover, unregulated construction activity along the central nodal locations, highways and other lifelines, is causing a lot of harm and will hamper further development activity. As such, any further delay in bringing the new Act into force will cause more damage and haphazard construction activity and development will continue without any check. Protest demonstrations were held all over the state by the CPM to condemn the firing incident that took place in Chamba district on Sunday.Senior CPM leaders on Monday met the Chief Secretary and submitted a memorandum to lodge their protest against the alleged mafia-style operation being carried out at the behest of a company constructing a 5MW hydel project on the Hul rivulet. CPM activists also staged a demonstration against the firing outside the DC office here. The activists also took out a procession which later culminated in a protest rally at Naaz. The rally was addressed by Tikender Singh Panwar, Sanjay Chauhan, Dr Kuldeep Singh and Vijender Mehra. They regretted that despite the protest going on for quite some time at the project in Hul, the government paid no attention towards the genuine demands of the people. “The common people, agitating against the high handedness of private companies, will not be cowed down as the companies will have to accept their genuine demands,” they said. CHAMBA: In the wake of the firing incident that took place in the Sillaghrat area of the district on Sunday, the CPM, CPI, CITU and Himalaya Bachao Samiti jointly organised a rally here on Monday. After the rally was over, state secretary of the CPM Rakesh Singha, while talking to mediapersons, demanded that the government must revoke the memorandum of understanding (MoU) with regard to the proposed 4.5 MW Hul hydroelectric project forthwith. He said the hydroelectric projects like Hul hydropower, having a capacity of 4.5 MW, was neither compatible to the wooded setting of the area nor it could add much revenue to the state exchequer. Himalaya Bachao Samiti’s navigator Kulbhushan Upmanyu also pleaded banning execution on the proposed Hul project. Meanwhile, SP Madhu Sudan, in a press release, said the accused in the firing incident had been arrested and further investigations were underway. MANDI: The CPI and the Gyan and Vigyan Samiti on Monday accused the private contractor and hydel power project company, executing the Chedera project in Chamba district, of resorting to the unprovoked firing on peaceful agitators in which Rattan Chand was seriously injured. Condemning the gunshots fired on the peacefully agitating protesters at the project site, state CPI secretary Des Raj and Gyan Vigyan samiti president Sunder Lohia said the company and the contactor hatched a conspiracy and hired goons who fired gunshots on the local protesters. “We demand a judicial probe and the guilty should be booked,” he demanded. They stated that the firing was unprovoked and demanded compensation for the environmental damage. HAMIRPUR: The CPM has strongly condemned the alleged firing and brutal attack on zila parishad member Rattan Chand and other panchayat representatives by “hired goons” at the Hul power project in Chamba district . He alleged that a few police personnel were maintaining close contacts with the contractors and their goons working in the power project. The CPM has demanded immediate arrest of the contractor and other persons involved in this incident and has asked that construction of the Hul project should be undertaken in consultation with the local people after resolving their grievances. However, the Chabads have become the “targets” and security concern in the state, sources said, quoting Union Home Minister P Chidambaram as saying at a press conference in Pune yesterday. Despite a fresh advisory on dealing with terror and precautionary measures from the Home Ministry, the state police and intelligence agencies in the wake of German bakery bomb blast at Pune that killed nine and injured 53 persons, the police and intelligence agencies were caught napping when the central investigating agencies zeroed in on Manali to find out the Headley links in Kullu-Manali, the sources revealed. The police said there was no “inputs sharing with the CIA” as to whether Headley had any links in Manali or not. According to police sources, they have received advisory on terror attacks and so far no linkage had been established as to whether Headley had links in Manali or not. Moreover, the Jewish New Year falls in September-October when droves of Jews make a beeline for Kasol, Manali, Dharamkot-Bhagsunag for their 10-day-long Rosh Hashanah and Yom Kippur festival. “We give spiritual and moral support to Jews visiting the remote valley in the Himalayas,” said Yoel and Rebbe, the head of Jewish centre at Kasol and Manali. “We are vigilant after terrorist attack in Mumbai on the Jewish centre in Nariman House,” they added. Kullu SP KK Indoria said the Chabads had been closed in winter as foreigners visit the valley in summer. DGP GS Gill said the police was on a high alert and all Chabads had security. However, the cow slaughter incident at Nerwa in the Chopal area has no link with the Pune bomb blast,” he asserted. Officials of the BBN Industrial Development Authority, who held a meeting with the ministry’s national productivity council, also received principle approval for widening of three roads, including Chakka road, Thana road and the road abutting on Annapurna hotel. The scheme has been approved under the Centre’s Industrial Infrastructure (cluster) upgrade scheme (IIUS) and its primary objective is to enhance international competitiveness of the domestic industry by providing quality infrastructure through public-private partnership in select functional industrial clusters or locations which have great potential to become globally competitive. The strategy involves providing critical features in industrial locations in terms of physical infrastructure, common facility centre, etc. The authority has been given a six-month period to prepare a detailed project report entailing the actual implementation of the project. Around 1,500 hectare area would be covered under the scheme and a site of 126 bighas has already been set aside at Kenduwala. About 1,000 units would benefit from this facility. The ministry has, however, directed the authority to enhance the share of industry and financial institutions from its present 10 per cent. While the user industries would be the shareholders in the project, Kenduwala would be the centre point where the plant would be set up. A spokesman of the Kangra district Beopar Mandal said all Beopar Mandals of the district had passed separate resolutions to this effect which had already been faxed to the Finance Minister and chairman of the Central Board of Direct Taxes (CBDT), New Delhi, requesting him for his immediate intervention. He said all branches of Beopar Mandals of the district had also urged the CBDT chairman to reconsider this decision and take care of the interest of tax payers who had been adversely affected by attaching north zone of the state with CIT(A), Solan. It may be recalled that the Taxation Bar Association of Kangra had also demanded restoration of the office of CIT (A) at Palampur. A memorandum to this effect was also presented to Union Minister for Steel Virbhadara Singh during his visit to Kangra and the association had urged him to take up the matter with Finance Minister Pranab Mukherjee. Two self-help groups were also honoured on the occasion and the minister awarded the farmers and groups (SHGs) with cash prizes of Rs10000 and Rs 20000, respectively, along with the merit certificates. Speaking on the occasion the education minister congratulated Hamirpur district for standing first in the implementation of Pandit Deen Dayal kisan-bagwan samridhi yojna so far. He also urged the youth not to run after the government jobs and seek their future in farming and allied sectors. Dhiman said an ambitious plan of Rs 353 crore was launched in the state in the last January aiming to bring a sea change in the economy of the farmers through diversification and by providing better infrastructure. He said at present farmers were being provided 80 per cent subsidy for the construction of poly-houses and raising irrigation facilities. Earlier, deputy director of the department AS Rana briefed detailed activities of the department. Chief adviser of the association CL Negi said here today that the factory had been closed for the past three years and growers had been procuring cartons from market without any hassles. Further, its cost of production was as high as Rs 44 per carton whereas cartons of same quality produced in private factories were only Rs 27 per carton. As such, revival of the unit, which had already accumulated huge losses, was not a feasible proposition. An engineering college, on the other hand, would benefit thousands of students who have to spend huge amount to pursue various engineering courses outside the state, he added. Moreover, the unit was set up to encourage growers to switchover from wooden packing cases to cartons to help save forests. Now that wooden boxes had been phased out and growers were using cartons freely available in open market at very reasonable rates, there was no need for reviving the unit. The college was a good option for utilisation of the land and other infrastructure available at the site, he added. Negi said a section of growers was opposing the move to drive political mileage from the issue and pointed out that some former office-bearers were trying to create confusion by issuing statement in the name of the association which was patently wrong. Negi also hailed the decision of the government to implement the anti-hail gun at Khara Pathar, in the heart of the apple belt, and said it was a laudable initiative which would help save fruit crops every year. He said it was wrong to make an issue over the location of the gun as it was a pilot scheme to ascertain its success. Once successful, it could be installed at various other places across the state, he said. After being briefed on the rescue operations, he interacted with trainees and instructors. The aspects of equipment, clothing and related issues were addressed comprehensively for better training ahead. He drove to Gulmarg by road through heavy snowfall and inclement weather to meet the brave and gallant trainers and to pay condolences to those who made the sacrifice. He said such challenges were a way of life with the Army and reiterated that no amount of inclement weather could deter a soldier from carrying out realistic training and mental robustness. Appreciating the exemplary courage and devotion to duty, Gen Lamba awarded the Army Commander’s Commendation Cards to Major Vijay Kumar, subedar Gokul Pradhan and havildar instructor Harbhajan Singh. 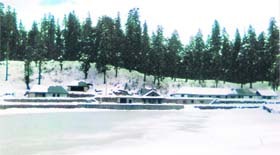 HAWA, the Indian Army’s premier training institute, was raised in 1948 to train soldiers fight, operate and survive in high altitude areas in snow craft, avalanche rescue, skiing and snow survival. It has produced expertise in training mountaineers, Antarctica teams and rescue experts that rescue trapped personnel in snow-bound areas, crevasses and people struck by avalanches. For the first time in its history, a tragedy struck at a place called Gujjar Hut, about 900 m from the institute. A heavy avalanche came from an unexpected direction, engulfing around 228 of 400 personnel. Universities and other institutes were carrying exhaustive research on high-yielding varieties of crops free from chemical inputs and healthy for human consumption. He said in the age of information technology, there was a need to exchange research outcomes and views on different farming practices so that the same could be replicated by stakeholders at the grassroots. The benefit of research must reach the farming community, he added. Dhumal also visited fields to take stock of hydrological, reforestation, environment services payments and allied activities in Costa Rica yesterday. He said there was a vast scope to exchange research work which could benefit the farming communities of both nations. He noted that Himachal Pradesh was spending Rs 45,000 per hectare on afforestation as compared to $900 per hectare in Cost Rica. Dr Carlos Rodrigues, vice-president, Conservation International, detailed different environment-related farming activities in Costa Rica. The loss of life would have been much higher but for the fact that the vehicle skidded downhill, without tumbling, after the first plunge. There were over 40 passengers on board when the mishap occurred around 4.30 am. The conductor of the bus rang up the authorities from the spot as a result of which rescue and relief operation started without the loss of time. The district administration and the staff of the corporation reached the spot promptly. The CPRF unit at Dharmapur played an important role in the relief and rescue operation. Initial inquiries made by the police and the corporation indicated that the bus first veered to the hillside and thereafter it turned sharply to the valley side and fell near the Cosmos Ferrite factory. The road was quite wide and was not prone to accident. Managing director of the corporation Somesh Goyal, who was in Dharamsala in connection with the Vidhan Sabha session, rushed to the scene of accident immediately. He said according to preliminary inquiry, the possibility of human error could not be ruled out. He has constituted a three-member committee under the chairmanship of divisional manager, technical, to conduct an inquiry to ascertain the cause of accident. The corporation will bear the entire cost of treatment of the injured, he added. Meanwhile, the police has registered a case of rash and negligent driving and investigation is on. Those who were present on the occasion included Horticulture Minister Narender Bragta, local MLA Suresh Bhardwaj, Rohru MLA Khushi Ram Balnatah, former Speaker Radha Raman Shastri, district BJP chief Sher Singh Chauhan and HIMUDA chairman Ganesh Dutt. Speaking on the occasion, Bhardwaj said the price rise, which had touched an all-time high, had virtually pushed the common man to the brink of starvation. “To top it all statements of the agriculture minister that consuming too much of sugar is harmful for one’s health is making mockery of the common man,” he remarked. He said the BJP would expose the Congress regime, which was out and out protecting the interests of the traders. He demanded that the President of India should either direct the UPA regime to take concrete steps to check price rise or else dismiss the central government. The district BJP chief said the central government was totally responsible for the price rise. The BJP leaders later held a meeting to discuss the state-level protest to be held at Shimla by the BJP on February 27. Stating this while speaking at an international conference on environment and climate change, jointly organised by the World Bank and the government of Costa Rica at San Jose, last evening, Chief Minister Prem Kumar Dhumal said a state resource information centre, to serve as a central repository for all databases on environment, natural resources and climate change, would also be established. He said a master plan for environment was already being formulated with the assistance of the World Bank in which spatial vulnerability assessment and sectoral guidelines for environmental protection had been incorporated. The state was developing tools and methodologies for green accounting in state planning and budget processes. It was assessing green house gases emissions for working out carbon footprints, he added. Dhumal said the state was implementing the World Bank-funded Mid Himalayan Watershed Development Project under which there was a provision for paying carbon credits in lieu of afforestation by panchayats and local communities. He said the state had signed an MoU with the Gas Authority of India (GAIL) for supply of piped gas for domestic use. Solar passive technologies and rainwater harvesting were being promoted in addition to use of non-conventional energy sources for space heating and use of charcoal, coal and other fossil fuels was beng discouraged. All departments had been asked to carry out energy and environment audits, and introspect on actions and policies for mitigation and adaptation measures. Superintendent of Police Kuldip Sharma said here yesterday that the authorised officer was not travelling in the car that was heading for Kullu-Manali, though there was another unauthorised person along with the driver in the car. He said the red beacon was seized and the driver was warned against its misuse in future. Earlier, this red beacon-bearing car was spotted speeding at the National Highway-21 at Nauni by a police patrol and stopped it checking. However, initially the driver refused to show any papers, but when he was warned that in that case the police had no alternative except to impound the car and detain the occupants for interrogation, the driver reconciled and showed the papers. The sources revealed that the deceased had been identified as Ashok Kumar, driver of Indica (HP-2D-0129). He was a resident of Luthoon village falling under Dalhousie tehsil. The body of the deceased had been handed over to his kin, the sources informed. The vehicle was on it way from Pathankot to Balkan, the sources further added. According to official information, about 100 volunteers participated in this camp. They cleaned the premises of the school, loaded the garbage in a tractor and disposed it of. The volunteers collected polythene from nearby areas of the school and sent it for safe disposal.